Day 3 of the German Masters Qualifers at World Snooker Academy, Sheffield. Today we will know who are going to play in the final round of qualifers tomorrow. The Nugget Steve Davis successfully qualified for UK Championship but he will not make it to Berlin this season. On-fire Robert Milkins shattered the Nugget 5-1 to play Joe Perry in the final round tomorrow. 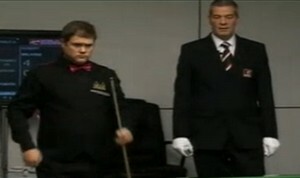 Adrian Gunnell continued his good form by whitewashing Jimmy Robertson to play Marco Fu tomorrow. 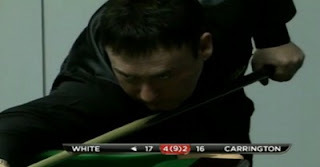 Jimmy White was lucky to survive Stuart Carrington's fight back - The Whirlwind went 4-1 up on Carrington before Carrington closed the gap to 3-4. The Whirlwind finally survived in the eight frame to win 5-3 on the final blue. Mike Dunn who made his first maximum break two days before continued to stun, he whitewashed Wicheard to set up a match against Joe Perry in the final round.